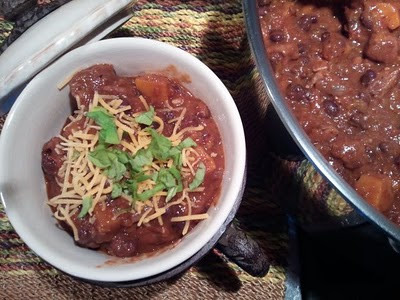 From Nana's Kitchen: Nana’s “Tricky Chili” is Easy, Yummy and GOOD for U! Nana’s “Tricky Chili” is Easy, Yummy and GOOD for U! Now, speaking of leftovers, another great advantage to this chili is that it calls for just 1 pork loin; since 2 generally come in a package when you buy them at the grocery store, you can preserve the other for a different dinner, on a different date! Tenderloins cook up in no time, and while you certainly don’t need a slow cooker to turn out an excellent pot of Nana’s Tricky Chili, her new Favorite thing—the All Clad 9909 slow cooker—is a good way to go in preparing it, just keep it a lower setting. Cooking this recipe on a regular stove only takes about 30 minutes after all! Now, I want to talk about the other ingredients; this dish is so simple you could fit them AND the cooking instructions as chicken scratch on the palm of your hand—however, as easy as its contents are, the nutritive cocktail this chili represents is pretty complex. Your body is going to L-O-V-E this supper, and I can’t think of a better time to make it than at the start of flu season. When “tasting the rainbow” is about more than the Skittles you’re handing out at Halloween! For those of you who don’t already know, flu season began October 1st and peaks in the coldest months of the year, December and January respectively. To protect and build your immunity, it’s a good idea to take your daily diet beyond the occasional bowl of chicken soup and feed it a nutritive rainbow of fruits, veggies, legumes and other anti-oxidant giving properties that protect your cells from cancer, the ill effects of aging and maintenance of good versus bad cholesterol. This chili represents enough of that rainbow to have some good luck waiting for you at its end; its tomatoes—the red band—are a source of lycopene that fight free radicals and help keep your skin wrinkle-free; the butternut squash is, obviously, the orange band and a beautiful dose of beta carotene—with help from Orange, the flu will have a heard time taking you over—but just in case, TOP NANA’s lookin’ out for you and included a link on flu shot (no appointment necessary; only $30 if you don’t have insurance) “Take Care” clinics around the U.S.